The ongoing “Best of 2009″ idea continues with: Stationery. When you touch the paper, your heart melts. The ink flows from the pen. What was your stationery find of the year? Usually I want to write so I don’t forget things, so I just grab whatever I can get my hands on. I usually jazz it up by using aesthetically pleasure magazines pages and my typewriter, but the only stationery I have been dying to have is airmail. 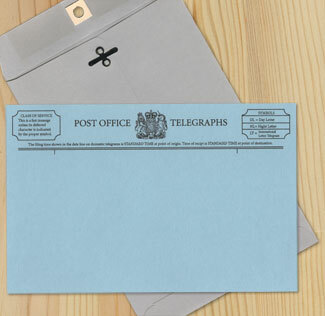 I love the airmail’s simple design, so i am constantly on the lookout for envelopes, pages and even labels. I also love all the correspondence on the Letter Writers Alliance/16 Sparrows website, but I usually don’t have the money to get some. awesome 16 Sparrows telegraph stationery.